On a November day forty-five years ago, the first episode of Days of our Lives appeared on the NBC Network. What few know though is that the show started as the dream of one family, the Corday family, who still owns and runs the show to this day. These are the days of their lives. The Days of our Lives is the first insider account of the history behind one of our most beloved soap operas. It is about the family who believed in it, conceived it, and sometimes seemed to live it along with millions of viewers, as they struggled to emerge from nowhere to create and produce one of the most successful and enduring television shows in history. You will discover for the first time the true stories behind the show, a story of living a dream and raising a family while things all around you, even fate, seem to conspire against you-and succeeding against all odds. "Blending inside stories about the show with a personal, philosophical view of his hardworking parents, the reader gets to experience a true classic American success story." 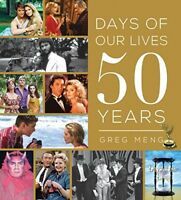 -- AOL NEWS "The Days of our Lives is a must for any fan of the show, or those looking into insight of daytime television." -- MIDWEST BOOK REVIEW "A really good book ... a loving, surprisingly spiritual, sometimes shocking tribute to the Corday family business ... revelatory." -- TV GUIDE The Days of our Lives is the first insider account of the true history behind one of our most beloved soap operas. It is about the family that conceived it, believed in it, and sometimes seemed to live it along with millions of viewers, as they struggled to create and build one of the most successful and enduring TV shows in history. For the first time fans will discover the true stories that drove the fictional ones they loved on TV,a story of living a dream and raising a family while everything around you, even fate, seems to conspire against you. The first insider memoir of the founding and history of the hit show "Days ofOur Lives."